"4 amazing magicians. 3 impossible heists. 1 billion dollars. This is no illusion." 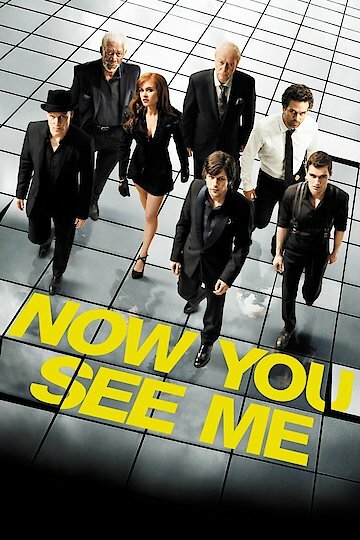 Now You See Me is a dramatic thriller that was released in 2013. It is directed by Louis Leterrier, and it was written by Ed Solomon and Boaz Yakin. The film stars Jesse Eisenberg as Michael Atlas, Mark Ruffalo as Dylan Hobbs, and Woody Harrelson as Merritt Osbourne. The supporting cast consists of Isla Fisher, Melanie Laurent, Morgan Freeman, Dave Franco, and Michael Caine. The film begins introducing a group of magicians that perform in Las Vegas. They are called the Four Horsemen. Michael Atlas is their leader, and they are shown performing highly technological shows that defy logic. During their show they rob a bank in another country, and they steal money from a rich criminal to put it in the bank accounts of all the members in the audience. The FBI puts Dylan Hobbs on their case. He is trying to stop them before they pull off another incredible stunt. For the case, he is partnered up with special agent Alma Vargas. Dylan does not approve of this decision, and he does not trust her. At this point, Dylan is desperate. He contacts a guy who knows the ins and outs of the world of magic, Thaddeus Bradley. Thaddeus goes into detail about how the Four Horsemen would have been able to pull their stunts off. In addition, the Dylan and his partner believe there must be an outside person helping them. They must find out who this person is before the Four Horsemen pull of their final trick. Time is running out, but there are no leads. As time progresses, Dylan starts to suspect that maybe Thaddeus, or even Alma could be the outsider he is looking for. The rest of the movie is Dylan trying to solve this mystery. Now You See Me is currently available to watch and stream, download, buy, rent on demand at FX Networks, FX+, FOX, FlixFling VOD, Amazon, Vudu, Google Play, FandangoNow, iTunes, YouTube VOD online.